Researchers have held tremendous interest in liquid metal electronics for many years, but a significant and unfortunate drawback slowing the advance of such devices is that they tend to require external pumps that can't be easily integrated into electronic systems. 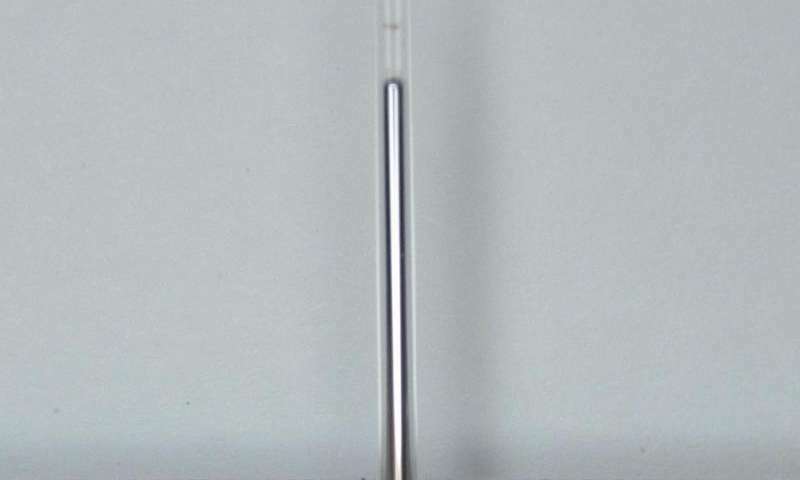 So a team of North Carolina State University (NCSU) researchers set out to create a reconfigurable liquid metal antenna controlled by voltage only, which they describe in the Journal of Applied Physics. The team's work was inspired by a phenomenon recently observed during studies of liquid metal by coauthor Professor Michael Dickey's group within the Department of Chemical and Biomolecular Engineering at NCSU. 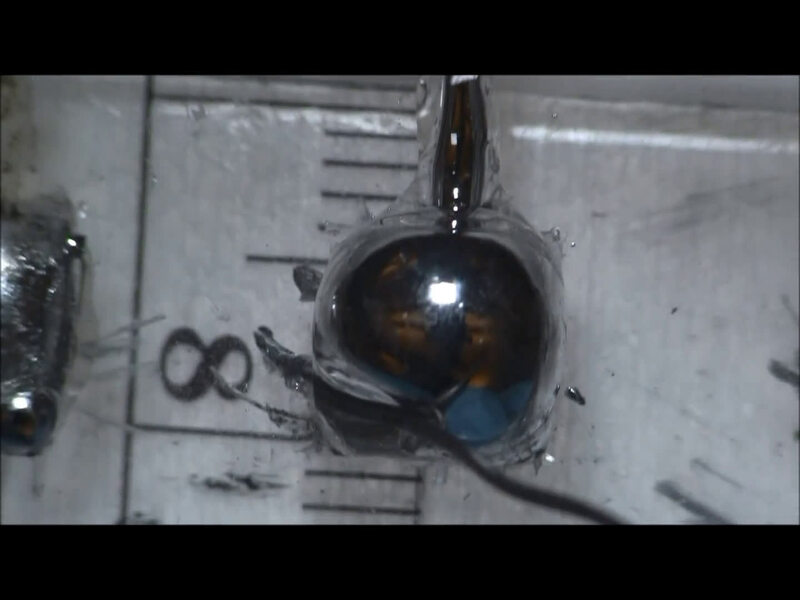 By placing an electrical potential across the interface between the liquid metal and an electrolyte, they found that they could cause the liquid metal to spread by applying a positive voltage—or to contract by applying a negative voltage. For a bit of background, the shape and length of the conducting paths that form an antenna determine its critical properties such as operating frequency and radiation pattern. "Using a liquid metal—such as eutectic gallium and indium—that can change its shape allows us to modify antenna properties more dramatically than is possible with a fixed conductor," explained Jacob Adams, coauthor and an assistant professor in the Department of Electrical and Computer Engineering at NCSU. How did the team create the tunable antenna controlled by voltage only? By using electrochemical reactions to shorten and elongate a filament of liquid metal and change the antenna's operating frequency. Applying a small positive voltage causes the metal to flow into a capillary, while applying a small negative voltage makes the metal withdraw from the capillary. The positive voltage "electrochemically deposits an oxide on the surface of the metal that lowers the surface tension, while a negative potential removes the oxide to increase the surface tension," Adams said. These differences in surface tension dictate which direction the metal will flow. This advance makes it possible to "remove or regenerate enough of the 'oxide skin' with an applied voltage to make the liquid metal flow into or out of the capillary. We call this 'electrochemically controlled capillarity,' which is much like an electrochemical pump for the liquid metal," Adams noted. Although antenna properties can be reconfigured to some extent by using solid conductors with electronic switches, the liquid metal approach greatly increases the range over which the antenna's operating frequency can be tuned. "Our antenna prototype using liquid metal can tune over a range of at least two times greater than systems using electronic switches," he pointed out. Myriads of potential applications await within the realm of mobile devices. "Mobile device sizes are continuing to shrink and the burgeoning Internet of Things will likely create an enormous demand for small wireless systems," Adams said. "And as the number of services that a device must be capable of supporting grows, so too will the number of frequency bands over which the antenna and RF front-end must operate. This combination will create a real antenna design challenge for mobile systems because antenna size and operating bandwidth tend to be conflicting tradeoffs." This is why tunable antennas are highly desirable: they can be miniaturized and adapted to correct for near-field loading problems such as the iPhone 4's well-publicized "death grip" issue of dropped calls when by holding it by the bottom. Liquid metal systems "yield a larger range of tuning than conventional reconfigurable antennas, and the same approach can be applied to other components such as tunable filters," Adams said. What's next for the researchers? They've already begun exploring the fundamental and applied elements of tunable liquid metals. "There's still much to learn about the behavior of the surface oxides and their effect on the surface tension of the metal," Adams said. "And we're studying ways to further improve the efficiency and speed of reconfiguration." In the long term, Adams and colleagues hope to gain greater control of the shape of the liquid metal—not only in one-dimensional capillaries but perhaps even two-dimensional surfaces to obtain nearly any desired antenna shape. "This would enable enormous flexibility in the electromagnetic properties of the antenna and allow a single adaptive antenna to perform many functions," he added. I recall, decades ago, some ham radio operators pumping salt water in to pipes to tune antennas, forming an hydraulically tuned antenna. This essentially re-invents the same thing. But then again, as they do this, all the stuff I've been trying to get people to understand, will finally make sense to a larger group. People might actually start to pay attention to what I've been saying, which would feel a bit weird, after being considered a fringe nutbar for so long. And this is the simple stuff! The thing to understand is that the liquid itself reconfigures depending on load.... and has a grater bandwidth, even without any change in length.